WASHINGTON (AP) — The United States is likely to average 95,000 more jobs each month this year, while personal savings will remain high as credit remains tight, according to a White House report released Thursday. The Council of Economic Advisers also trumpeted the $787 billion economic stimulus package, which it said has saved or created about 2 million jobs. In a message to Congress, President Barack Obama pointed out that the economy he inherited was losing 700,000 jobs each month. "I can report that over the past year, this work has begun. In the coming year, this work continues," Obama said in a letter he sent to the Capitol attached to his economic update to lawmakers. "But to understand where we must go in the next year and beyond, it is important to remember where we began one year ago." Casting its first year as positive, the administration's 462-page report served as a summary of its logic and a pitch for Obama's future agenda. Recognizing voters were likely to hold Obama to account for the economy, the White House team cast blame on their predecessors and unpopular Wall Street bankers. "I think there's just no way to understate how huge the economic challenges facing the country have been this past year," said Christina Romer, head the Council of Economic Advisers. "So everything obviously from the financial crisis, the terrible recession, but the longer-run problems — the stagnating middle-class incomes, soaring health care costs, the failure to invest in education, innovation, clean energy — we certainly inherited an economy with a number of economic problems." It's not clear whether the it-didn't-break-on-my-watch message would resonate with voters. Republicans were quick to describe the document as propaganda masquerading as governing. "The Obama administration's report is full of blame for the policies of years past, praise for its own failed policies of the past year and promises about their ideological agenda to grow government," said Republican House Whip Eric Cantor of Virginia. "Instead of praising themselves and blaming others, a greater focus on small businesses and smart solutions to reduce uncertainty and create jobs would be welcomed and is long overdue," Cantor said. Indeed, even adding an average of 95,000 jobs each month, unemployment is likely to remain around 10 percent through this year and not fall below 6 percent until 2015. And while Americans are likely to save more for big-ticket items such as homes or cars, it means a slower recovery for a nation that has lost 8.4 million net jobs since this recession began in December 2007. Obama's economic report predicts the economy could grow at a rate of 2.5 percent, in line with what the administration's economists predicted last year. Mark Zandi, founder of Moody's Economy.com and a frequent adviser to lawmakers, said the White House economic projections track his own. 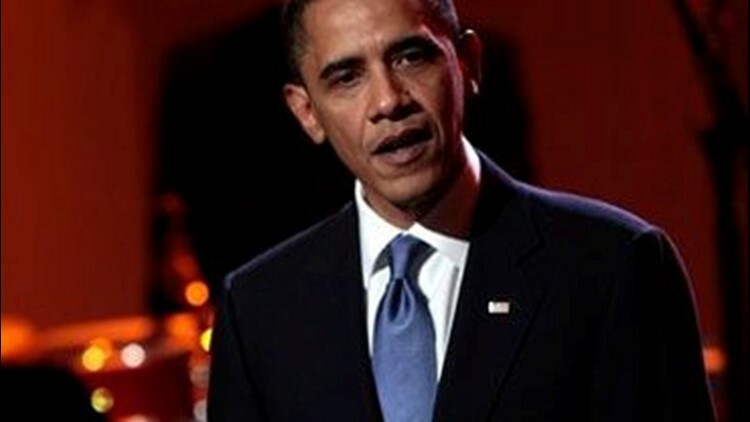 A jobs bill worth $100 billion to $150 billion, he said, would accelerate a decrease in unemployment. That also lines up with a bipartisan Senate proposal that promises to add 80,000 to 180,000 jobs over a year. "If we go back into recession it will be very difficult to get out of it," said Zandi, who advised Obama's rival, John McCain, in the 2008 presidential election. It will be even tougher if Americans continue to save at high rates — somewhere in the 4 percent to 7 percent range — as the White House report predicts they will until the financial services sector eases lending. The report put it more bluntly: "A full economic recovery is unlikely until and unless the financial system is repaired." That pressures Congress to take action on the regulatory changes Obama has pushed to address weaknesses in the financial system that led to the 2008 financial crisis. The legislation aims to increase consumer protections on loans and credit cards, add restrictions to previously unregulated financial products and find ways to dismantle failing firms without resorting to taxpayer bailouts.